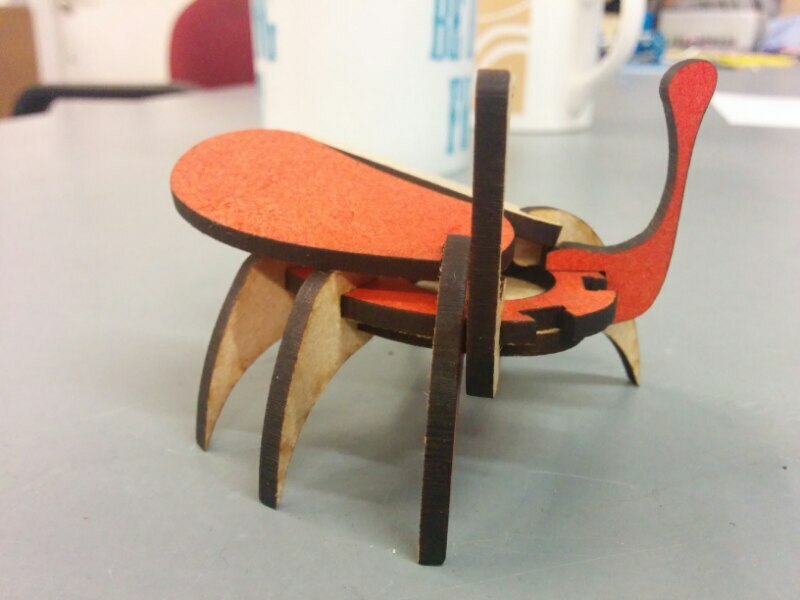 We like to do occasional workshops at the Hackspace, so when we were asked to make something 'bug themed' for a workshop, we jumped on it. 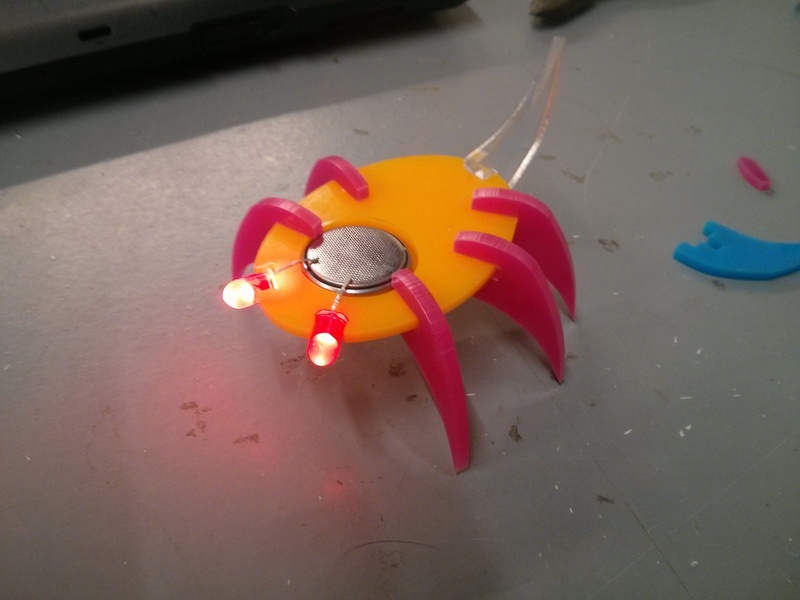 The first thought we had was to make up some bug-shaped PCBs with a circuit to flash LEDs, and run a soldering workshop. When we found out the workshop was a week away, we panicked a little, as that's not really enough time to get PCBs manufactured at a sensible price. 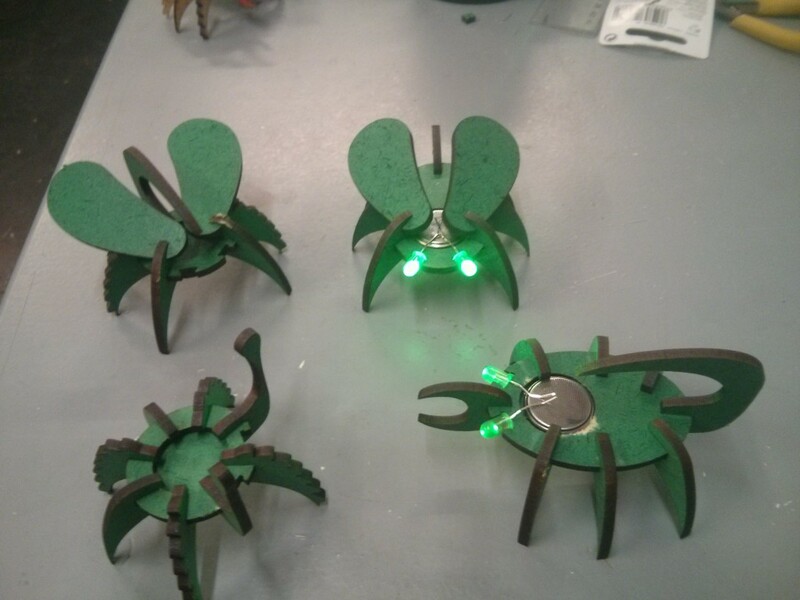 We decided instead to make little laser cut bugs with LED eyes, as they can be made with easily available materials, and infinitely customised. Step one was to choose a material. Our first experiments were with acrylic. I whipped up some designs for 'joints', which would friction fit onto the side or top of a 'body'. 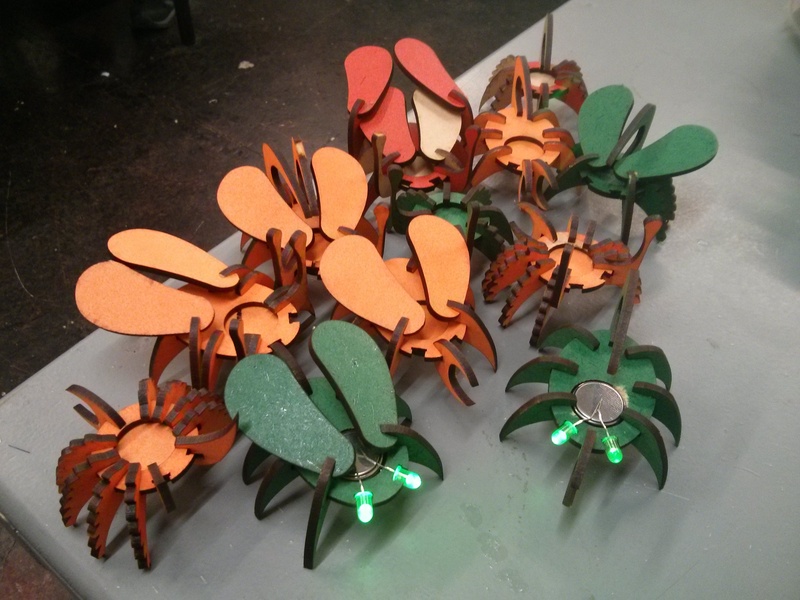 I attached these to a curved path in inkscape for the legs, and bug #0 was born! Bug #0 had a couple of issues, mainly due to the material choice. Acrylic thicknesses can be a bit variable, the tolerance can be as wide as ±10%, and it is fairly brittle. the combination of these two issues caused at least one broken leg (hence #0 having 5 legs!). We decided to have a go at laser MDF instead. Laser MDF is basically MDF made with a glue that is less harmful to people and laser cutters than regular MDF. It has the advantage of being very dimensionally accurate (our 3.2mm MDF was measured at 3.21mm), and having a bit of bend before it breaks. Bug #1 was born. It assembled a lot easier than #0, and has cool looking scorched edges. At this point I started designing some add-on parts to allow attendees to customise their bugs, including wings, tails, hairy legs, and mandibles. The only issue with #1 was losing the wide range of colours available from acrylic. However, I had a flash of inspiration, and gave a sheet of laser MDF a light coat of red spraypaint. This dries fast, and gives an awesome splash of colour. Bug #2 is alive! This time sporting a lovely pair of wings and some antennae. #2 was done with just one side of the wood painted, which gives a cool effect. depending on what side of the bug you're looking at. 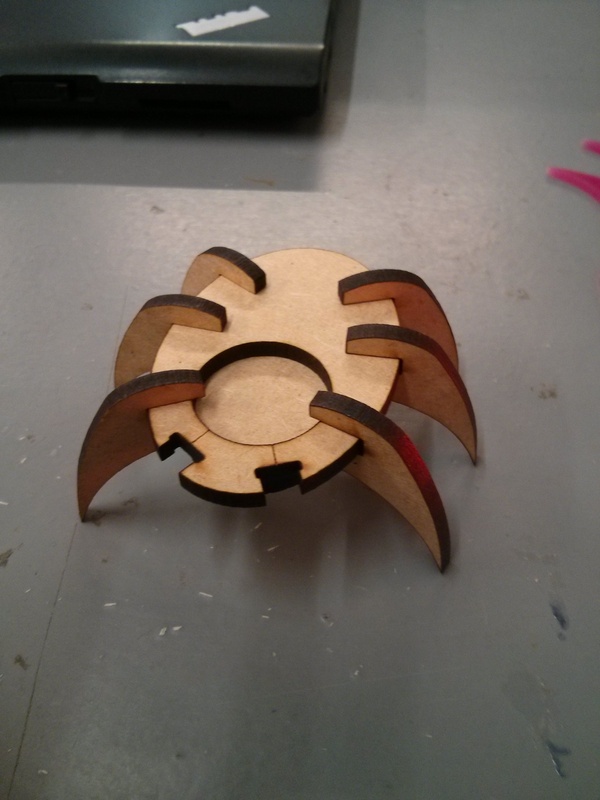 We now have a swarm of these delightful Lil' Buggers invading the hackspace. With a magnet and a dab of hotglue they'll stick to anything metallic, and their LED eyes last for a couple of days on a coin cell.